My arrival to Cambodia had a goal of not only visiting the Angkor Archaeological park with its many temples, but also to visit the Koh Ker pyramid. After I saw many temples, I arrived at the conclusion that the Koh Ker pyramid is the only true pyramid on Cambodian land. It seems that it has nothing in common with the other pyramidal temples, largely decorated with Hindu symbols. Koh Ker is 115 km (71.46 miles) away from Siem Reap and Angkor Wat. The Angkor Archaeological park is visited by several million tourists a year, but Koh Ker is largely forgotten. Basic operations were done in the 1960s to prevent further decay, but renovation never happened. The pyramid is well-preserved. It is constructed with the combination of processed volcanic rock laid inside the structure and sandstone blocks on the exterior. Exterior blocks are of different dimensions, and a combination of concave and convex, with four to six sides. Uneven dimensions resulted in the structural stability of the object, which is preserved until today. The first level of the pyramid has 11 rows of blocks. The second level has 13 rows, and all other levels (third, fourth, fifth, sixth, and seventh) have eleven rows of blocks. The blocks are joined with mastery - not binder, plaster, or cement. The hexagonal blocks serve to lock down the whole structure. The sides are oriented with the cardinal points. The only entrance to the pyramid is from the west side. There are no visible entries into the pyramid. A hidden entrance is probably located underground. It’s forbidden to climb the original stairs - which are in ruins. But, there are improvised wooden stairs to allow visitors to climb to the top. The blocks of the first six rows are between 500kg and 2000kg (1102.31 -4409.25 lbs.) in mass. The big blocks are on the top and they reach up to seven tons. The square frame shaped from the blocks on the top has an exterior decorated with Hindu designs. The gods are holding, not the Earth, but the Sky in their hands. The frame made by the biggest blocks frames the inner passage’s “chimney”, which goes all the way to the bottom of the pyramid - The energy “chimney”. This pyramid obviously isn’t like other temples in Cambodia. However, somehow the architects pushed it together with the temples. The term which is used for this pyramid is Koh Ker Temple, but almost all the elements for the pyramid as an energy machine are present here. The pyramid is the most powerful shape when it comes to energy. It amplifies existing, natural sources of energy. The artificial construction materials are sandstone blocks (conductivity) and volcanic blocks (the presence of iron as an electromagnetic source). The constructed artificial lakes and channels around the pyramid allow for water flow, releasing negative ions as an energy source and using kinetic energy from the water stream. The concentric squares (walls and terraces) become smaller, directing and focusing the terrain’s energy to the pyramid. There are seven levels of the pyramid. Seven is a sacred number in the Hindu religion. But odd and indivisible numbers, prime numbers, are also part of sacred geometry. Here they are used as well: 7, 11, and 13. The elements of sacred geometry amplify the energy. The vertical interior passages focus energy, creating the result of the pyramid as an energy amplifier. Poor ornamental features on the pyramid reminds one of the Hindu religion and the Khmer ruler from the 10th century. But, the question is, who was the architect who had consolidated the knowledge of geodesy, astronomy, construction engineering, and cosmogony? Architects all around the world had this identical knowledge. It can be seen, for example, in: the Kukulkan pyramid on the Yucatan (Mexico), Mayan Pyramid in Palenque (Mexico), Tikal (Guatemala) and Copan (Honduras), the Pyramid of the Sun and Moon in Teotihuacan (Mexico), and the so-called Cheops and Khafre pyramid at the Giza plateau (Egypt), twenty big Shanshi pyramids (China), the Bosnian pyramids of the Sun and the Moon (Bosnia), and Gunung Padang pyramid in west Java (Indonesia). All the mentioned pyramids have an energy beam on the top. The architect carefully arranged the structure, water surfaces, and water channels. In explanations, it is certain they spoke to kings about artificial lakes as the “proto-ocean” from the Hindu legends of the creation of the world, but also on practical aspects and irrigation - which allowed the Khmer State to have an economic boom from the 10th to 13th century. For the architects, water was necessary only for kinetic energy. The impressive height took the kings to the sky, closer to the Gods and the fulfillment of the “Axis-Mundi” legend. The Gods had to be satisfied with the king’s magnificent architectural undertaking and show mercy in case they decided to reside exactly in that location on the Earth. But the architects also used this building to create a beam of energy which sends information on the Earth’s frequencies and it’s “health”. The pyramid was built over already focused energy sources. The geometrical shape was ideal for energy manipulation. Angkor Wat is built over a different kind of underground energy, which looks like more like ring energy. 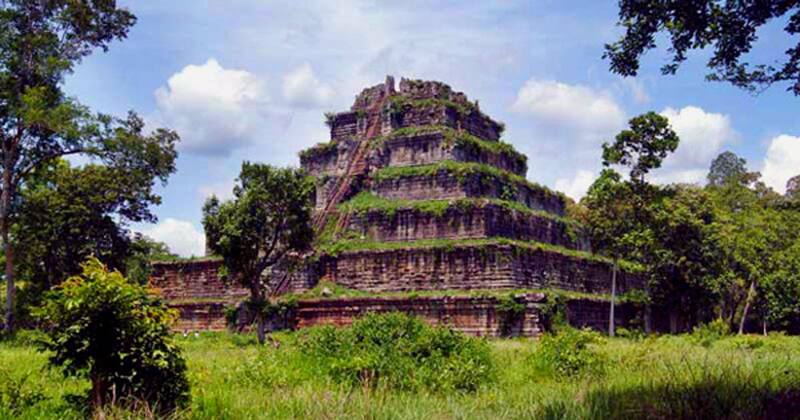 Therefore, there is a different design at Koh Ker in comparison to the pyramid temple of Angkor Wat. Those who climb to the top of Koh Ker pyramid today can see the force that was used during the construction of the pyramid. They come guided by instinct, not knowing the true purpose of this building, in the past or now. Even if it was 36 degrees Celsius, my stay in Cambodia was very satisfying. Koh Ker pyramid confirmed my doubts in the existence of a global school of cosmic architecture. These unknown architects used local customs, religions, and workforce to realize their own goals.